so the parents will have fewer messes to clean up! 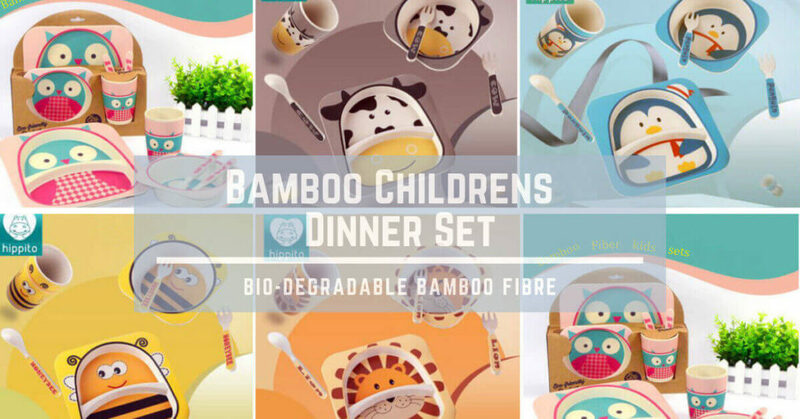 What a precious bamboo fiber dinner set for a toddler! design underneath! The bamboo children's dinner set help toddlers and young children transition into using adult tableware and utensils. The bright colors will always bring smiles to any child's face as they see this beautiful set in front of their chair at the table. like to drop things on the floor, and with that, at times they tend to break. This 5 Piece kids set is made out of bamboo fiber which is functional because it does not break and just bounces when dropped from a high chair or table. bought for the little ones. It describes the texture as making it easier for kids to hold and handle and reduces spills. hasn't stained, It appears to be holding up well to everyday use. LesHero's bamboo fiber kids' set has a matte finish and is made of biodegradable, sustainable bamboo fibers. 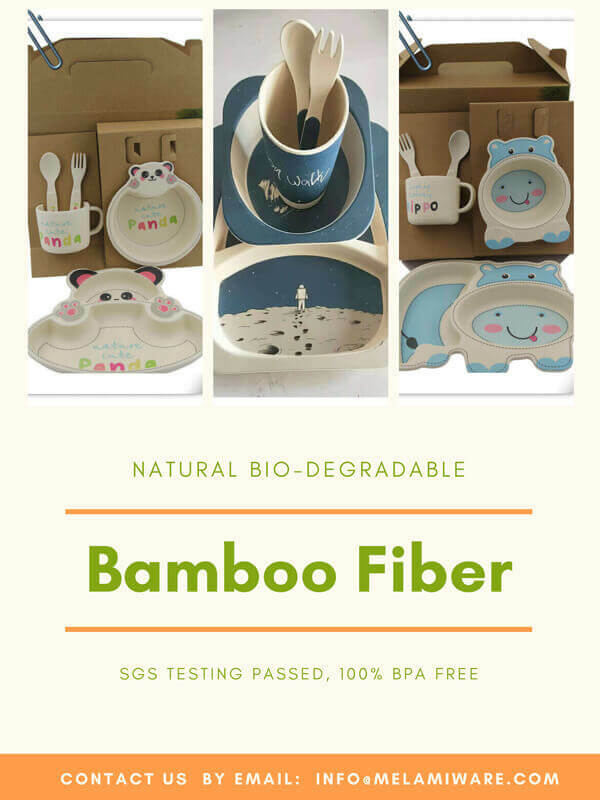 Why should you purchase this Bamboo fiber kid set? Bio-degradable Bamboo Fibre, 100% BPA-Free, shatterproof. FDA food safe approved. Natural Non-stick surface and easy to clean. Even you don't use the detergent! Dishwasher safe but not suitable for microwave or oven use. Various 5- Pieces model: includes 1 Plate, 1 Bowl, 1 Drinking Cup, 1 Spoon, 1 Fork. It's an amazing gift for your toddler in holidays, Christmas, and etc. Dinnerware set is specifically designed for children who are beginning to eat on their own! Packing Color box or others. Delivery date Around 25 days. 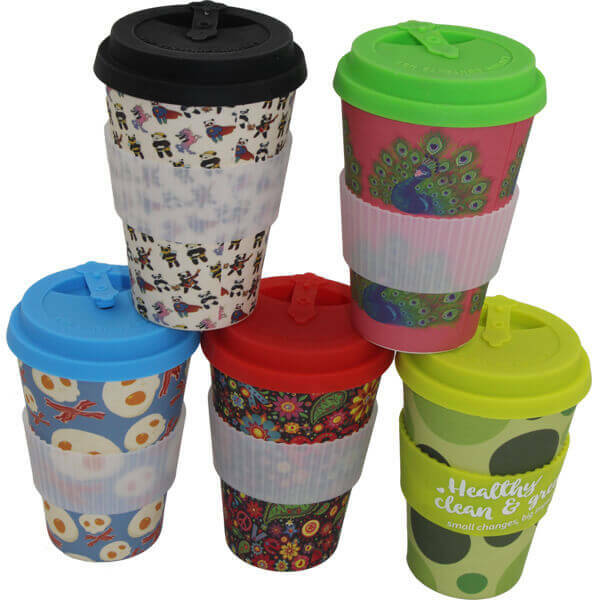 460ml bamboo fiber mug, the coffee cup made of bamboo fibres with reusable silicone rubber lid and sleeve. It is a perfect size compared to other bamboo fiber cups you have!